Home > Christmas Decorations > Father Christmas Has Arrived! 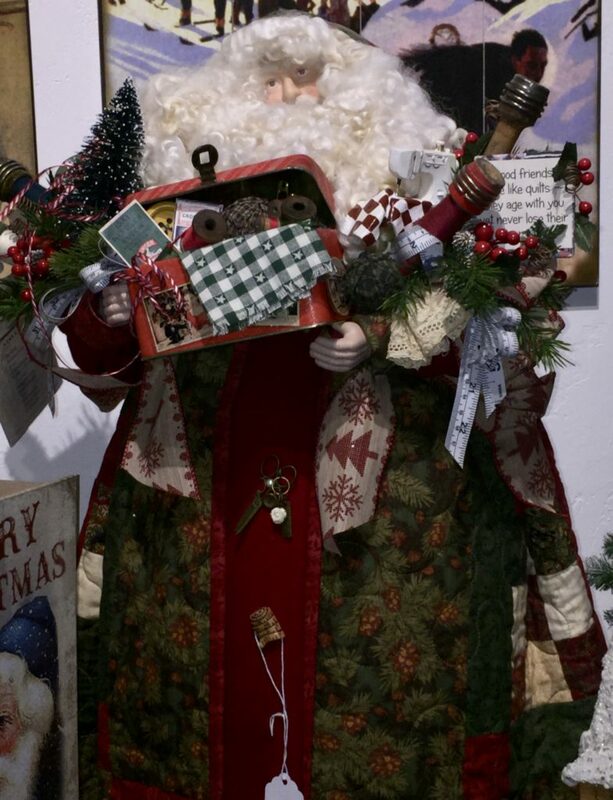 Featured at the Gilde Spruce is our collection of 4 distinct Father Christmas figures. All of these are hand-crafted by Kay Burkhart. Each Father Christmas has a porcelain face and hands. 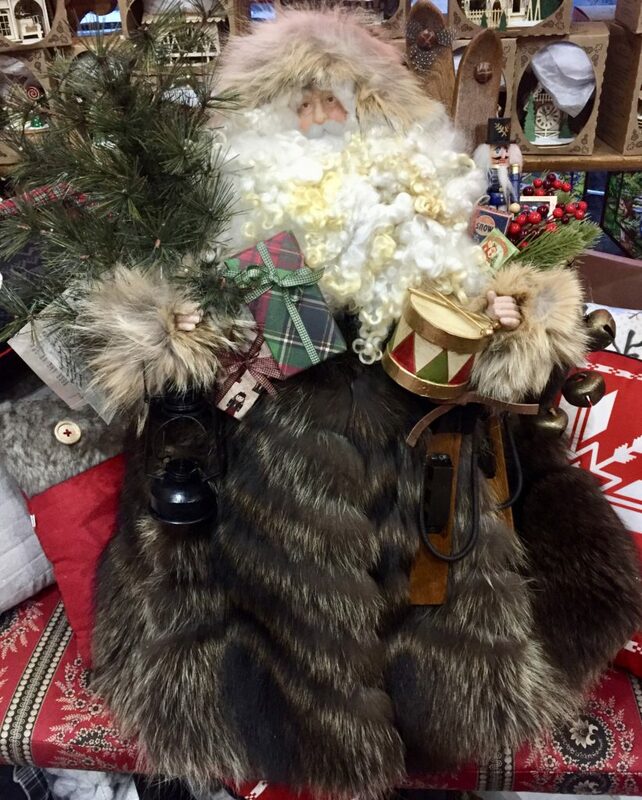 Every Father Christmas is crafted with old woolens, vintage furs, and wonderful old costume jewelry. All of these one-of-a-kind pieces have an authentic wool beard. There are no two alike. All come with this numbered, signed, and dated card. “I have created this Father Christmas just for you. I have stirred in some memory and tradition, too. I’ve mixed in old toys for good little boys and jewels and curls for good little girls. He is one of a kind, made with love and great pleasure. He seeks a warm home where he’ll be held as a treasure.” Kay Burkhart. 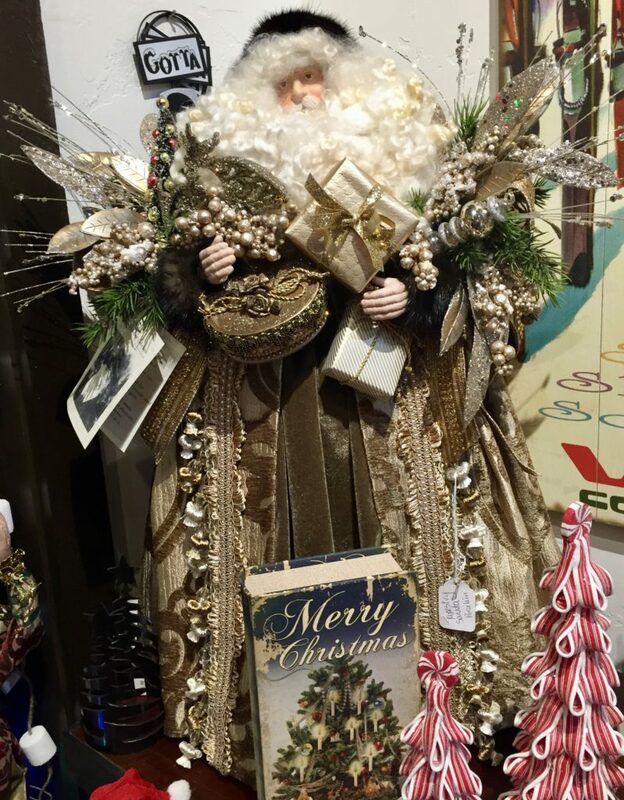 The Father Christmas above is 27″ high and about 21 inches wide. It has an antique lantern, Christmas tree, presents, old wooden ski’s, drum, Nutcracker, old bells, berries and books! The fur is vintage raccoon for his coat and hood. Questions or more images please call us at 970-476-5113. All of us who work at the Gilded Spruce have decided this is our new favorite. Such a unique piece and hand-made idea. Absolutely gorgeous! 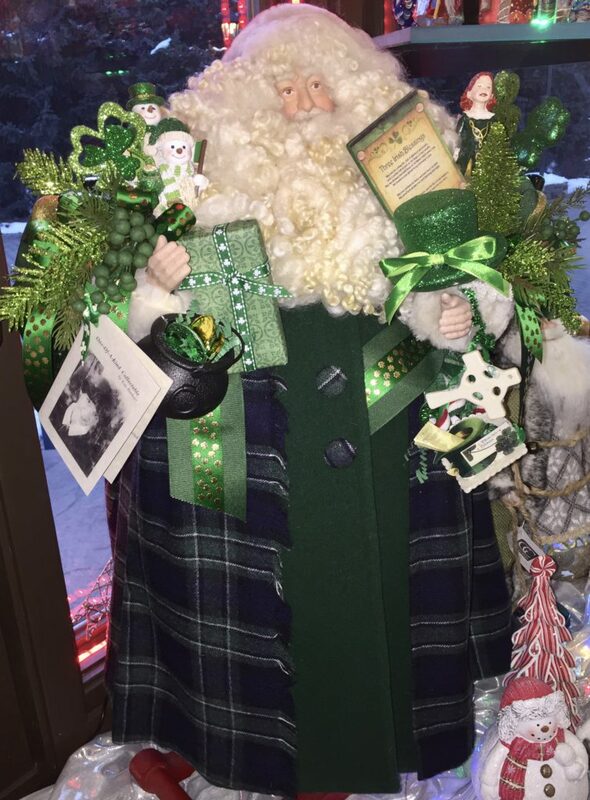 Irish Father Christmas is 27″ high and about 21 inches wide. Classic Celtic Plaid with woolen coat. 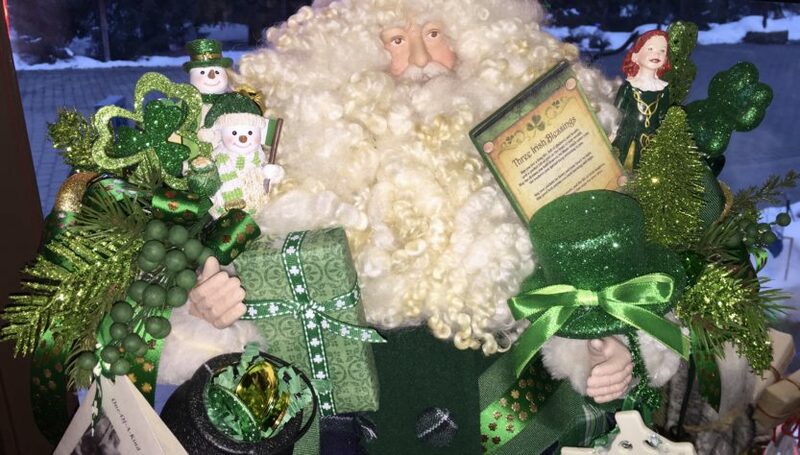 Pot of Gold of course, gifts, Irish dancer, Snow women and Man with Irish feel, shamrocks, Celtic cross, Irish hat, Irish blessing, mixture of ribbons, berries and greenery! May you live a long life, full of gladness and health, with a pocket full of gold be the least of your wealth. May the dreams you hold dearest, be those which come true, the kindness you spread keep returning to you. May the sound of happy music, and the lilt of Irish laughter, fill your heart with gladness that stays for every after. The Coat on this Father Christmas is a tapestry with detailed embellishments of trim, ribbon and sparkles. Under the tapestry is velvet adding gorgeous depth to this work of art. In the arms are sparkling ornaments, reflecting the light a very old world and classic feel to this piece. It stands 27 inches high as well. The Quilted Father Christmas has a quilted coat, unique buttons on the front of a measuring take, antique scissors and ruler- so cute and specials. If you are interested in this Father Christmas call 970-476-5113.